What better way to start your vacation than to camp on the ocean? Imagine being able to wake up to a beautiful, panoramic ocean view, and fall asleep to the sound of the waves. At Mt. Desert Narrows RV Resort you can park your RV or pitch a tent right on the water. While you may not want to leave Mt. 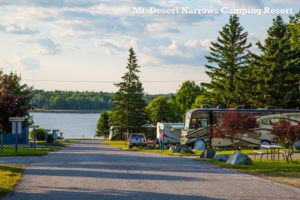 Desert Narrows RV Resort, if you do you’ll find Acadia National Park and Bar Harbor are a short drive away. Maine’s rugged coastline is beautiful and diverse. This popular birder destination is home to a variety of plants and animals as well as the tallest mountain on the U.S. Atlantic coast. At Acadia National Park you can hike amongst the mountain’s granite peaks, bike along it’s historic trails, or relax and enjoy the ocean scenery. Bar Harbor has been a popular destination for vacationers for over a hundred years, but although the area is well known, it’s not overrun with tourists, so it’s perfect for anyone looking for a quiet island escape. Although the pace is relaxed in Bar Harbor, there’s lots to do on this famous island, including Seaside Cinema nights and Taste of Bar Harbor pub and restaurant tours scheduled throughout the summer. If you’re planning to visit over Memorial Day or the Fourth of July, then book early – these are popular times of celebration on the island. Once you’ve explored the Bar Harbor area, we suggest that you make the eight-hour drive to the Adirondacks in New York State. Whether you start this trek in the morning or afternoon, consider stopping in Manchester, New Hampshire (which is 4.5 hours from Bar Harbour) for either lunch or dinner. While in Manchester, you can check out a local brewery (Stark Brewing Company, Third Colony Brewery and Winery and Candia Road Brewing Company are popular choices), or if you prefer to add some culture to your trip consider stopping in at the Currier Museum of Art or catch a show at the Palace Theatre before driving the remaining 3.5 hours to New York state. The Adirondacks are a geographically expansive area, so it can be difficult to figure out where to focus your time. We recommend Lake George. 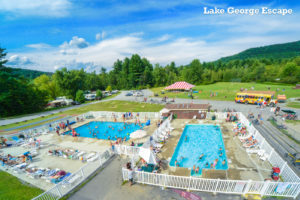 Surrounded by the six million- acre Adirondack Park, it’s no surprise that Lake George Escape is one of the top RV parks and camping getaways in New York State. Located just 15 minutes from the Village of Lake George and Saratoga Springs, the park offers guests a passenger bus to these popular nearby destinations so you don’t need to worry about how you’ll get around. That is, if you want to check out the nearby attractions! You may prefer to stay in the park where you can spend your days swimming, fishing, canoeing or hiking, and your evenings sharing memories and making new ones while watching holiday fireworks displays. As you can imagine, Lake George Escapes is a popular destination, especially during the holidays so you’ll need to book in advance if you’re planning to go over a long weekend. But if you want to explore the area and haven’t pre-booked your trip, try nearby Lake George Schroon Valley Resort. Here, you’ll have access to a full scope of camping options including RV sites, cabins and tent camping. Located directly on the Schroon River, and nestled in the foothills of the Adirondacks, Lake George Schroon Valley Resort is popular for its river pursuits including swimming, kayaking, canoeing, tubing and fishing. Designated in 1892 by the State of New York, Adirondack Park is a diverse mountain landscape that is home to waterways, forests and huge mountains. New York State owns 2.6 million acres of the park, making the region the largest publicly protected area in the United States. Over 50 species of mammals live in the Adirondack Mountains, including moose, black bears, beavers, star-nosed moles, red and gray fox, bobcats, and river otters. If you love nature, then plan to spend some time here! Saratoga Springs is a bustling area with golf, horseback riding, and even hot air balloon rides! You’ll find amazing shopping, spas, dining and more here. If you love to watch horse racing, polo matches, or want to check out a farmer’s market, local winery or even a craft brewery then take a day or two to explore this area – there are plenty of fun activities to keep you busy at Saratoga Springs. If you’re looking for a drop dead gorgeous beach then Pulaski, New York is the place for you. Just a 3.5-hour drive from the Lake George area, Pulaski is located on the eastern shores of Lake Ontario, which means you won’t have to travel south to experience a relaxing beach vacation! 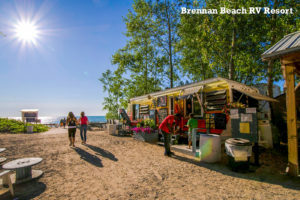 Stay at Brennan Beach RV Resort and you’ll have the unique experience of beach camping in New York where you can soak up the sun on the white, sandy shores or go for a refreshing swim. The sunsets here are one-of-a-kind. In fact, this RV park is so popular that during the peak months of July and August Brennan Beach RV Resort bookings are for a minimum of one week (so depending on when you’re traveling you may want to plan to extend your stay here and reduce your time elsewhere). Whether you choose to follow this itinerary, or create one of your own, if you’re looking for tips about where and when to visit the Northeastern states, give our customer service team a call at 1-877-570-2267. They know all the ins-and-outs of the Northeastern United States and can give you the insider details and perspectives that will make your trip a memorable one.